The Coroner for Southwark and the City of London, Sarjeant William Payne, was an unexpectedly youthful man, just 34, who wore a gold ring on his right hand inscribed with the Latin tag ‘Reverentia Legum’, revere the law. In 1866, he presided over the inquiry into two unusual suicides both of which led to the by then controversial verdict of felo-de-se, self murder. Until 1823 this verdict routinely resulted in the punishment of the offender by driving a stake through his heart and the burial of his corpse at a crossroads. It also meant the forfeiture of the suicide’s property to the crown leaving any dependents destitute. In practice most suicides were judged to be ‘temporarily insane’ a ruling which left their property and their rights to a Christian burial intact and only the worst cases, usually involving the suicide of a murderer or other criminal, were deemed to merit the punishment meted out to John Williams, the supposed Ratcliffe Highway murderer who killed himself in Coldbath Fields prison whilst awaiting trial. His corpse was paraded around the scenes of his crimes in East London accompanied by a silent crowd of 10,000. After being whipped and dropped onto his knees into an open grave at the crossroads of Canon and Cable Street, a stake was hammered through his back with the maul he had used to kill his victims. “As the blood stained maul thudded on the stake,” one commentator noted “the silence of the crowd was at last broken and the air became hideous with shouts and execrations.” These quaint practices ended when the 1823 Burial of Suicide Act allowed felo-de-se’s to be buried in the unconsecrated parts of churchyards and cemeteries, albeit without any form of religious service and only between the hours of 9pm and midnight. The lifeless body of the man was lying on a form, face upwards, with one leg hanging down, the head being nearly severed, and the right hand clenching a razor.— The floor was covered with dry, clotted blood, from which it is supposed that the act was committed nearly a week since. The arrangements for effecting his own death must have taken the deceased some time accomplish. A modern bedstead and a form were the chief articles of furniture in the room, in which was a small cupboard. The door of the cupboard was found open, with the bedstead placed near it, the former being fixed alongside. Vellens had employed a hatchet used in his trade, in which he bored a hole, but finding the leverage not suited to his purpose, he made another higher up the handle. This he fixed to the bedpost by a screw, and a piece of strong rope was then procured, to which was attached a heavy stone. The rope was then thrown over the cupboard door, the end being fastened on the one side and the stone hanging over the other. He must then have placed himself on his back on the form, raised the hatchet, and put his head so as to meet it when it fell. In this position he cut the rope with the razor, and the stone falling on the hatchet, his death must have been instantaneous. Sarjeant Payne summed up for the jury by telling them that this was one of the most determined cases of suicide which had come under his notice. He remarked that “the deceased had followed the French idea, and made a guillotine on a small scale.” As it was obvious that he had committed suicide the only question for the jury was the state of the deceased’s mind at the time. According to the newspaper accounts the jury deliberated for only a short time before delivering their verdict that the act had been committed whilst the deceased was in a sound state of mind. Sarjeant Payne had no choice but to enter a verdict of felo-de-se and order a night burial of the body without a religious service. He also ordered the dismantling and destruction of the homemade guillotine. This however, I declined. It is unpleasant enough in all conscience to make a business jaunt to a graveyard, but to ride thither on a hearse at night - seated on the black, shiny roof; and holding on by the stumps that on ordinary occasions support the funereal plumes, was not to be thought of; especially as the journey was to Ilford, a dismal country road in part and ten miles from London. So I elected to go in a vehicle of my own choosing. They took "it" up punctually at the time appointed - Mr. Beadle and two men of the staff of the contracting undertaker who undertook the job. The box they put "it" in was composed of half a dozen unplaned boards scantily smeared with a blackish pigment and roughly nailed together. It was scarcely of the ordinary coffin shape even, and being without plate or inscription might have been carted to a railway with other luggage without exciting particular attention.. ... A pair of stout horses were attached to the hearse, and whirled it over the stones at a spanking rate, so that my coachman had some trouble at times in keeping it in sight - especially as it was so very black-horses, carriage, and men-and the moonlight but fitful, skulking behind cloud-banks sometimes for as long as two minutes together. I don't know how Mr. Beadle (being, as before hinted, a somewhat nervous man) found it on the hearse roof; with the felon's body within two planks' breadth of him, hurrying along the dark road, with the wind whistling across the bleak flat country. I know that I found it anything but satisfactory, and was not at all sorry to hear my man say, "I can see the Rabbits, sir; the Rabbits is the house where all these black jobs puts up for a freshener, sir." ....at a distance of more than a half mile from the entry, in the unconsecrated part, a hole was found. It was fortunate that at this time the moon struggled out of the clouds, otherwise there might have been some bungling, for, being but an amateur at felo-de-se burying, Mr. Beadle had forgotten all about the torches. Had it been pitch dark, with torrents of rain falling, the job would have to have been got through somehow. As it was, it was got through with neatness and despatch. The grave-digger was an old hand, and had his ropes about the box in a twinkling, and held one while the undertaker's men held the other. "Lower," said the grave-digger, and they lowered, and the box rested on the clay. Then the grave-digger threw a few shovelsful of earth on the box - enough to cover it - and replaced the planks over the hole, and we went away. "Why didn't they cover him in entirely ?" I asked. "What for? We couldn't spare a regular interment a grave all to himself; let alone one such as him," replied the grave- digger. "But surely you won't put another body over his?" "Surely we shall," answered the grave-digger. "Not a Christian, you know," he hastened to explain -"one of them sects what don't care about being buried in consecrated ground. Why, what's the odds? He's as good as they are now anyhow, if he wasn'efore." And discussing kindred matters, the hearse bowled out of the cemetery, and once more we put up at the Rabbits, where the party invited the grave-digger to the social glass and the friendly pipe, and, the undertaker's men as well as the grave-digger being well versed in sepulchral lore, quite a jolly hour ensued, when, hey for London! with our noble work accomplished, and the law's majesty and dignity vindicated. 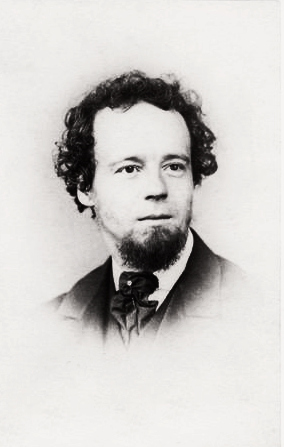 James Greenwood’s story “At the earthing of a felo-de-se” was later published in his book “The Wilds of London” (1874).